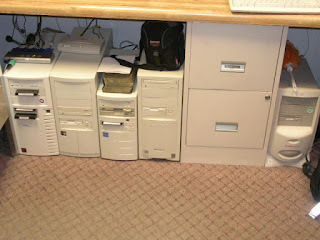 HAL 9000- The line up of ancient computers that used to run the shop. Ten years ago this week on the blog I had computer troubles and there weren't but three posts for the week and those were mostly updates I posted from the shop to let the meager amount of readers here know what was up. Posting from work, well......that wasn't cool, really. Interestingly enough, and some of you may remember how it was then, blogging was seen as an "upstart activity" back then. Managers and owners were afraid of bloggers and how they were "pulling curtains down" and showing who the Wizard of Oz really was behind all the smoke and fire. My boss was one of those folks for quite some time. Then there was my utter lack of any technical skills. Computers? I could hen peck at the keyboard and barely make Blogger function back then. If anything went wrong, I was sunk. Fortunately, I married well, and Mrs. 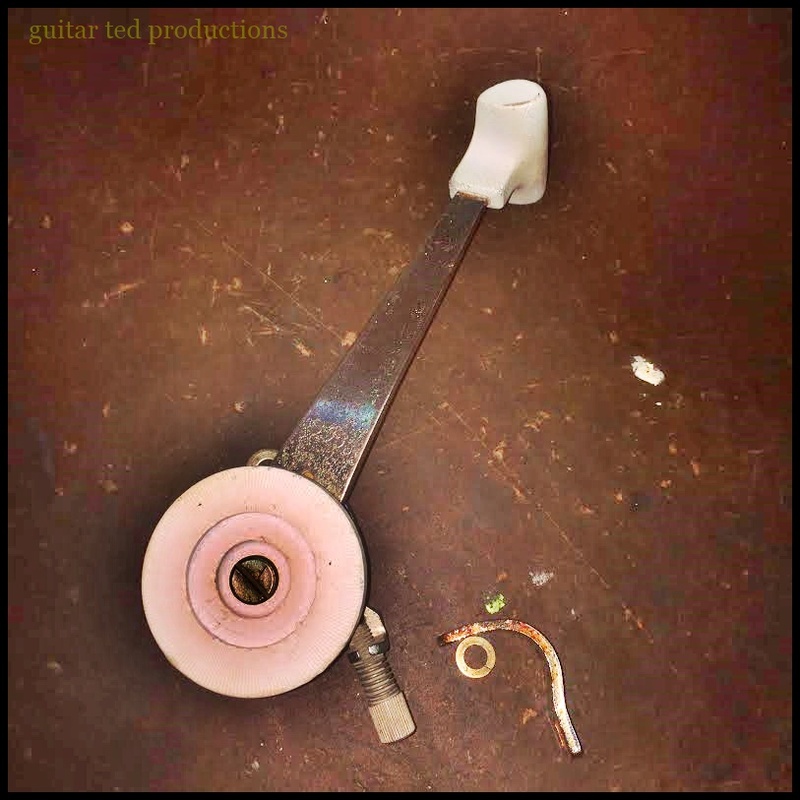 Guitar Ted happens to be a whiz-bang tech person with skills beyond her schooling. She just has a knack for electronic devices. So, back then she diagnosed my computer, (we each have our own computers to this day, by the way), and figured out that mine had somehow gotten a bad virus. Turns out it had FOUR viruses, and the local computer joint fixed me up. That marked when my wife installed some pretty burly anti-virus, fire wall stuff on my computer and that hasn't happend since those days, thankfully. Now ten years on, I still am not really well versed in computers, and to wit: My RidingGravel.com partner does ALL of the techy business for that site. NOT me! I'm definitely not that guy. No wordy post today! Just wanted to share some views from the shop. It is Winter, and I have a bit more time on my hands these days. 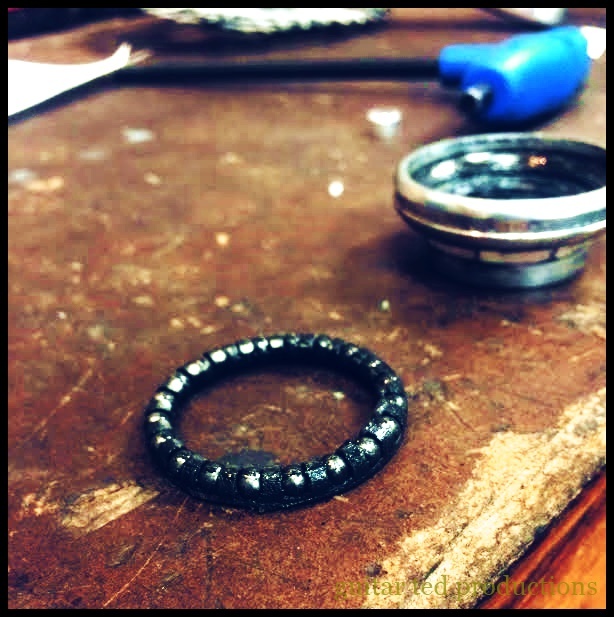 I figured I would take a few "close up" views of some of the work I have been doing of late. I used an iPhone 5s this time, and I used an Olympus Tough TG-3 camera on the "Microscope" setting, then I did a little post-processing fooling around, and that's it. These aren't meant to be great "photographs" because I simply don't care what "technicalities" are offended or encouraged in my take on these. I simply look at this like drawing or painting, and the end look overall is what pleases me. Maybe you'll like them, maybe not. Nuff said, here's the images for today. 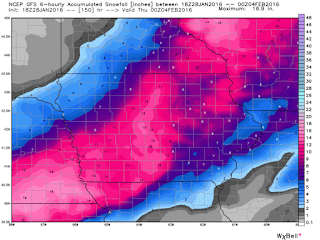 A model run for next weeks snowpocalpse. 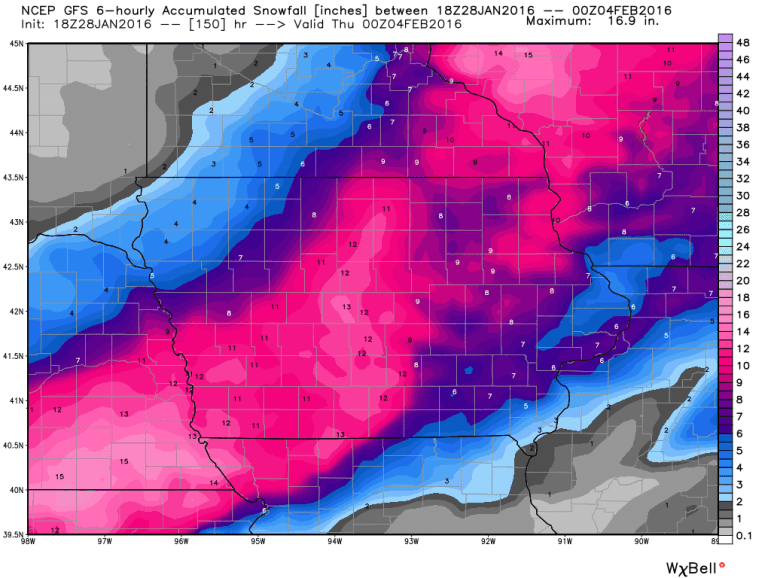 If you live in Iowa, Nebraska, or Wisconsin you've probably already been made aware of the possibilities, (weather guys say it is almost a slam dunk), of a huge snow and wind event that is to occur on Ground Hog Day. It sounds as if this could be a pretty serious blast. It's pretty funny how the weather has been so strange in many places in the world. It seems that here, more often than not, that our Winters start out mild and tame, then are back-loaded with cold, snowy weather which typically reaches its zenith in February. This Winter season certainly seems to fit that pattern, and last year did as well. However that is, we seem to be headed straight for a big ol' Winter snow storm, the likes of which we haven't had for a few years here. Then again, you have that odd, seemingly ironic claim by many that when the weather guys say, "not much snow", we get a ton, and when they say, "watch out! it's going to snow a lot! ", we don't get but a dusting. I know it seems far-fetched, but everyone here has a story about when that has happened once. I don't know, I suppose that by now you'd hope that science and technology would be allowing more accurate forecasting, and I think it does. I'm pretty sure we're going to be getting dumped on then. 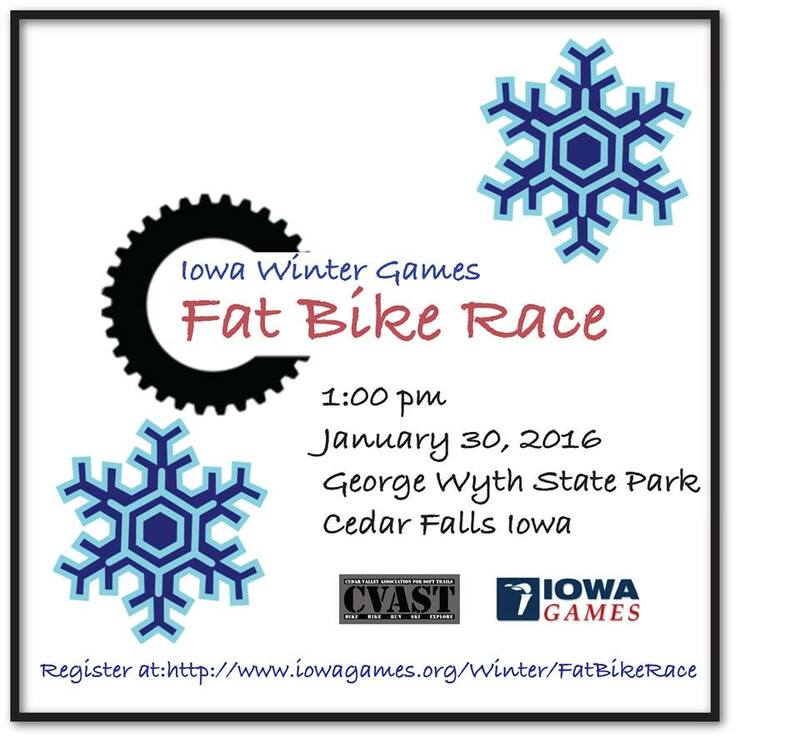 Looks like fat bike season will be getting another shot in the arm and we'll be riding into mid-February, at least. WooHoo! We've got a fat bike race in our own back yard tomorrow over at George Wyth State Park. It's part of the Iowa Winter Games, and I believe things should be pretty fair for conditions then. Yeah.....too bad this wasn't last weekend or next! The snow would have been better, but that's the way the cookie crumbles. They have groomed the course, and are hopeful that it holds up for the event. Registration on site will be accepted, by the way, as on-line registration has closed. I suppose many may be wondering if I will be going to race this event. Well, the short answer is "no". I won't be doing this. Long answer: I'm terrible at short events, and the weather looks to be fantastic, 40 degrees and sunny, and a long gravel ride to sneak in a Cup O Dirt Challenge qualifier seems quite possible for that day instead of doing a fat bike event which I won't be good at. So, I am really hoping to get back on a gravel bike for a ride and to bag at least a metric century before January is done. Putting on a bicycle event is fraught with red tape and infrastructure necessities that start to add costs at an alarming rate. Many events that charge an entry fee are raising those fees as a result of rising prices to promoters for insurance and other "unseen features" of events that racers may not be aware of. 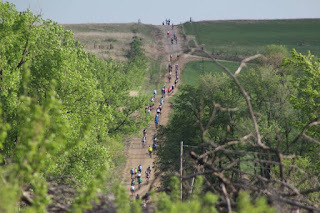 At the Iowa race Director's summit, I heard enough about red tape, risks, and liabilities that made me feel like never putting on a bicycle event again. Really.....it was depressing. You have no idea, unless you have or are promoting a cycling event, what an "onion" an event really is. The layers upon layers of costs incurred make your head spin. 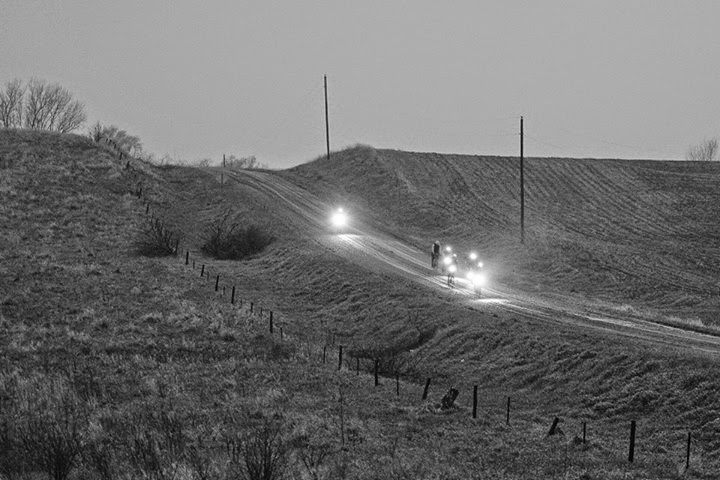 Take for instance a well known cross race held here in Iowa that may go to World Cup status this year. The promoter of that event told us his three day event's budget is just into six figures for getting it all together. Six freaking figures folks! That's a complex, monstrosity of an event, yes- but that is a truckload of dollars right there. I actually found this article, which is written by an event promoter in Arizona, which maybe helps put things into a perspective we all can understand. In the article, the author gives you an item by item cost to put on a criterium for 350 racers. That's a good sized event, but not out of the ordinary by any stretch. Check it out. Then maybe it will be clearer as to what it takes to put on a good event. One of the commenters on this article made reference to just going out and hitting the gravel. I think that points to a good reason as to why gravel events have taken off the way they have. Costs to put on these events seem to be quite a bit lower with a lot less red tape barring the way as well. It could help explain why both the number f events and why the number of riders riding these events has exploded over the past ten years. Well, that's a wrap for this week. Get out and enjoy some fresh air, and ride 'em if ya got 'em! I got out early to catch the best conditions will be for a while. This Winter of '15-'16 has rendered the best fat biking conditions we've seen since 2011. The freeze thaw cycle the snow went through about three weeks ago really set up things nicely. Now with an additional two or so inches of fresh snow on top of the old stuff, the wilderness around here has been primed again, albeit for a very short time, with primo fat bike conditions. This all seems to be a very short lived situation though. With today, close to freezing, if not a touch over, and the next three days being well above freezing, the trails are going to deteriorate quickly. There is talk of a big dump of snow happening maybe next week. We'll see. I wasn't going to wait to find out, so I hedged my bets, got out early Wednesday while the snow was still crunchy, and made some tracks in the Green Belt. The temperatures were already in the upper 20's by 8:30am when I headed out. The snow was still holding in some cold though, so it was set up enough that I had good grip in all planes and my front Bud and rear Chinese branded tire were doing a fine job. The tracks were burned in by a few riders the day before, so all I had to do was to follow the thin treaded line through the bumpy trail. I didn't push things too hard though, as I knew the trails were very hard and slightly icy before this latest dump of snow. I didn't want to hit a post holed terrain feature and end up going down on really hard snow. Nice and easy was the order of the day. There was evidence of someone or another having a few "off-line" slide outs here and there. It was still slick under that new snow! Marky-Mark is one of the tougher, more technical sections of trail for fat biking we have here. It's tough not to dab. I decided to go through the Marky-Mark connector trail since I had heard it was good to ride Tuesday. I traveled on it in both directions and it was rideable, although I dabbed once each way. That slick, icy underlying snow with that new unconsolidated stuff on top was very challenging. I also took a detour on some bandit trail some guys have flagged out which goes beneath the Ridgeway Avenue bridge which crosses the Back Hawk Creek. Not many people use this trail, and no one had been on it at all since the last snowfall. It may not look like it, but that's bandit trail along the Black Hawk Creek under that fresh coverlet of snow. I managed to clear the bandit trail and went back on the old Green Belt trail to Marky-Mark and re-traced my path from there. I was happy I was able to clear all the tough spots past Marky-Mark without dabbing, which was nice. Then I rolled it through a long alley way which was fun and finally back home. Now we'll have to see what happens with this next spate of warmer weather and if we get that big dump of snow next week- or not. The reality is that we've got maybe a good four more weeks of possible good snow sports weather ahead, and maybe a week or so less than that. 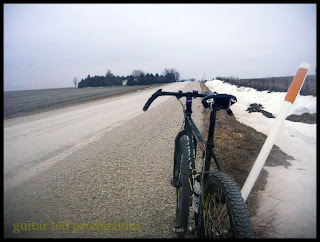 March isn't far away now, and I'll be back riding gravel sooner than later. This may be the last good snow ride I get in. Okay, so this is going to be a disjointed post with some random stuff- randomonium- get it? 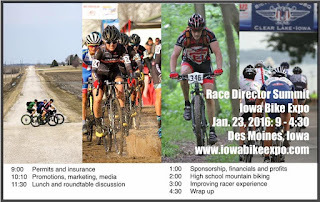 Over the weekend I celebrated my birthday, and along with that I attended the Iowa Race Director's Meeting as a panelist and went out to view some of the Iowa Bike Expo which was being held in the same building. I'd never been to this gig before, and it was impressive. The meeting went on after noon, but I didn't bother with the topics being presented then, as they didn't really have any bearing on how I put on rides. So, the expo was right after my segment at the summit. I went up to see it with my family in tow and saw a few folks that I don't get to see all that often. Interestingly, there were a lot of folks around and about for what amounted to lunchtime. I was fairly impressed by that alone, but the booths with some bike shops, rides, and cycling related concerns was also cool. I was telling Mrs. Guitar Ted that we would skeedaddle on outta there after I made a promised contact and then we'd eat lunch. Well I made that contact, then I saw two more folks I wanted to chat with "quick", and on the way out we were stopped twice more! I just cannot seem to walk five paces at a bicycle gathering without stopping to chat! There just isn't enough time in the day, I tell ya! Found on the wall at Krunkwich Ramen House. Well, we finally did make our way out of there, and then drove across the Des Moines River to see Krunkwich Ramen House, the restaurant which is owned by my friend, Sam Auen of Tacopocalypse fame. My family had eaten there twice before without me, so I was eager to try out the grub on offer there.
" Krunkwich Ramen House is Des Moines, is Iowa’s first restaurant dedicated to the art of Japanese and Fusion Ramen. The restaurant is brought to you by the minds behind Tacopocalypse. Our focus is on fresh, local ingredients used to create dishes inspired by the foods of Japan, Korean, China, Vietnam, while also drawing from the foods of Europe and the Americas." I ordered the #99 which is "#$@&!! Ramen" because it's hot 'n spicy. I like my food with some heat, so I was down with this deal. Mrs Guitar Ted had "Kimchi and Bacon Krunkrice". I won't get into the details of what was in these items, but if you are curious, here's Krunkwich's menu. The kids had Japchae, (jop-chay) and Banh Mi with Krunk Tots. Everything came in a timely manner and the wait staff was really chipper and kind, despite their being rather busy at the time we were there. Okay, here's the deal- if you are ever in Des Moines and looking for good eats, go to Krunkwich. It is amazing. I ate my selection with gusto, tried Mrs Guitar Ted's selection which was also awesome, and had a couple bites of the Japchae which had a smoky, earthy taste. My meal was spicy as I like it, and Mrs. Guitar Ted's was a total mash-up of American and Asian which I cannot explain in words, but it was great! Just go there, or to Tacopocalypse, either will blow your face off. In a good way. The Black Hawk has receded, and the ice went out for now. We went home and on Sunday I got an afternoon ride in at the Green Belt, which I mentioned yesterday in the Body Float review I posted. It was chilly, but really not too bad in the woods. I saw several folks out and about. Walkers and other fat bikers were seen from one end of the Green Belt to the other. It was cool to see that many folks had realized the benefits of being outdoors instead of having their faces plunged into a device of some sort. One thing that did bother me a bit though was that I noticed some yahoos had been through the Southern most end of the Green Belt on a quad vehicle. While the tracks were mostly benign, and didn't really affect too much, that isn't the point. The City of Waterloo Parks & Recreation Department is to blame here because of the way they maintain the Green Belt. It used to be that they left the trail alone until late August, and then they mowed it once with a "bush hog" type mower, which has a swath of maybe four feet or so. Too narrow a path for most motorized vehicles to bother with. There used to be a few deterrents to motorized vehicles in the form of wooden plank crossings of the creek and a deep ditch on the South end that used to require a dismount if you were cycling and was more than six feet deep. Now with the rip-rap the City dumped in, the removal of the bridges, and with the filling in of that big ditch, there are no deterrents to roving motorized vehicles in there. To make matters worse, the City clear cuts the trail with an enormous end loader instead of a bush hog mower, and the trails are wide enough now for a car or truck to easily pass through. And you know what? I've seen car or truck tracks several times on the South end. The widening and sanitizing of the Green Belt is going to result in an accident someday between a non-motorized user and a motorized vehicle of some sort. I've seen moto cross bikes, snowmobiles, and ATV's back there, and it wouldn't take but one blind corner with a biker or hiker just around the bend to have a bad situation occur. Waterloo should not have widened out the trails so much, and if the City insists on doing the wide clear cutting, then some gates or bollards need to be installed at certain points to fend off the motorized users. Either that, or say ta hell wid it, and just allow a free-for-all situation where motorized users and human powered users mix it up in whatever way happens. Having signs posted saying that motorized users are not allowed is certainly not working. That's for sure. Okay, that's enough random thoughts for one post, I'm sure! The Cirrus Cycles Body Float seat post: Under the protective shroud! The Winter is starting to show signs of change here, and I fear that fat bike conditions are going to deteriorate to the extent that I will be switching over to some gravel travel again soon. Since that seems to be the likely case, I thought I would download my current thoughts on this unusual Body Float seat post for now. You can go back to my original introduction of this post on my fat bike HERE, or see a bit of an update I did back in December HERE. I've done a lot of miles on this post this Winter in varying conditions and in temperatures ranging from sub-zero to the 50 degree mark. I've been in deep, unconsolidated snow, packed in snow, ice, mud, pavement, and dirt. Terrain has ranged from very muddy to frozen ground and frozen, post-holed snow, which resembles riding on uneven, rough concrete more than anything else. In the following paragraphs I will relate my fat biking experiences, but I also intend on continuing these comments after I have had the post back on a Fargo and perhaps a gravel rig as well. So, for now here's the views I have on this device. I have had really good experiences so far with the post and its workings. There have been zero issues with the mechanism, the way it functions on a day to day basis, and it does what it is advertised to do. The bottom line here is that, while the post is a fair chunk of change to purchase, it lives up to its billing. The darn thing works and it makes me want to ride the Ti Mukluk it is installed on more and more. It is hard to portray in a picture, but the trail here was hard, frozen, uneven, and pock-marked snow. Like cement, basically. The defining ride in the last month or so was the past weekend where conditions had turned our trails into cement with an undulating, pock marked surface. Well......okay, not really cement, but frozen so hard it was like cement. You get the picture here, I'm sure. It was rough, and not at all like snow usually is to ride on. There was no forgiveness in the trail surface whatsoever. I went out a bit easy at first to feel out how much grip there was. It was a tiny bit slick, but not too bad. After I passed a couple of guys on the way out to my turn about point, I hit the gas and went about as fast as I would dare to any other time on a dry trail on a 29"er. So, pretty darn fast. So fast that the trail was jack-hammering my rigid front end so hard that I had numb hands and I thought I might get tossed off the bike by the rough surfaces. In fact, I went off-line a couple of times, it was so rough. A front suspension fork would have been the ticket here, but alas- I don't have one for the Ti Mukluk. Conversely, the rear end, while it was by no means less bouncy than the front end, was damped in a beautiful way by the Body Float post. In fact, I felt it bottom out a couple of times on hard hits, but the bottoming out wasn't harsh at all. During the rest of the ride it was getting worked really hard. There was no time during my two and a half hour ride that the Body Float was getting any reprieve from the constantly undulating, rough trail surface. I suspect it was cycling through almost all of its travel during most of that time. Post ride pose. The Body Float post has proven its worth on a fat bike. Verdict.....So Far: Worth every penny. Basically that's the bottom line. On a fat bike, where slower travel and undulating, uneven trail surfaces are common, especially on soft snow, or hard, crusty, frozen snow, the Body Float will not only absorb those compressive hits, but it allows you to stay on the pedals, spinning, and maintaining momentum. This is crucial in many situations on a fat bike, and if that was all it did, I would be happy. However; the Body Float also smooths out the small to medium trail chatter that can end up making you go numb, or fatigue your body prematurely. There is also some minor traction benefits and in some situations where you are seated and climbing, the Body Float, allowing you to have uninterrupted pedaling, also keeps your body from bouncing off the post/saddle on trail irregularities and causing your tire to lose traction. Obviously, if you are out of the saddle, the Body Float has zero benefits, but for a fat bike, where being seated is often the case the majority of your ride in soft conditions, this post pays big dividends. As stated above, there are absolutely zero mechanical concerns, and the post worked at sub-zero temperatures exactly the same way as it did at 50°F. The post shows no signs of loose pivots or hardware failure. The saddle clamp and position of the saddle during the review period has been stable and unmoved since installation. The post fits into the Ti Muk's seat tube perfectly and hasn't slipped. I should mention that this is the Titanium shafted Body Float post. I am going to continue to utilize the post in other bikes soon and I am confident it will have a long service life. When it comes to the geometry of bikes, and especially of those for gravel travel, long time readers here should remember my various posts on my take on the sort of geometry that makes for a better handling and riding bike. If you are fairly new here, I will just say that my take on gravel bikes began to form back in 2010, and since then, some folks have listened that had the power to make bikes based on these ideas. Some folks have said that this all wasn't necessary, and that other bikes would do just as well at what it was I am after- the best handling and riding gravel bike I could get. While one can ride whatever the heck they want to, on any surface they choose, to deny that geometry is tweaked to meet highly specialized tasks in cycling would be ludicrous. That time trial bikes, cyclo cross bikes, and crit bikes exist, when one could do all of those things on a traditional road bike, is all you really need to understand that specialized geometry is prevalent in cycling, and has been for a very long time. I don't think I need to bring up mountain biking, but the illustration works there as well. Secondly, my thoughts on geometry weren't something I made up, but were pulled from history. I knew that lower bottom brackets, slacker seat and head tube angles, mated with a longer offset fork were from early 20th Century road bikes that had to be able to traverse roads made of dirt and gravel. Precisely what I wanted to do with my bikes. In my mind, "settling" for a cyclo cross bike was just not an option, nor should it be. The bikes eventually came out- The Raleigh Tamland, and another which is in the same vein, the Twin Six Standard Rando. The lower bottom brackets, slacker angles, and room for big tires which make riding gravel more comfortable and stable were just what I was after. Still, many people rail against these ideas as something the marketing machine came up with to "invent a new category" that is not necessary, in their opinions. That's all well and good, but I knew those opinions were either based on illogical thinking, or simply misinformed. Then I got wind of an article on the "Red Kite Prayer" site about old road bike geometry. The "Italian geometry" is something that I had heard about in years past. The lower bottom brackets, and the slacker head tube angles. These were the ideas I had drawn my inspiration from. While some may think my ideas were "unnecessary" or whack, if you take the time to read the article, you will find that many builders and professional riders knew otherwise. It's real, it makes a difference, and many people have never ridden a bike with this sort of geometry to know the difference. In the end, is it all just "splitting hairs", and can't we all just ride one bike and get along? Of course it is, and "no", of course we can't. I'm grateful either way that the "gravel bike" exists and that we have the right tool for the job now. 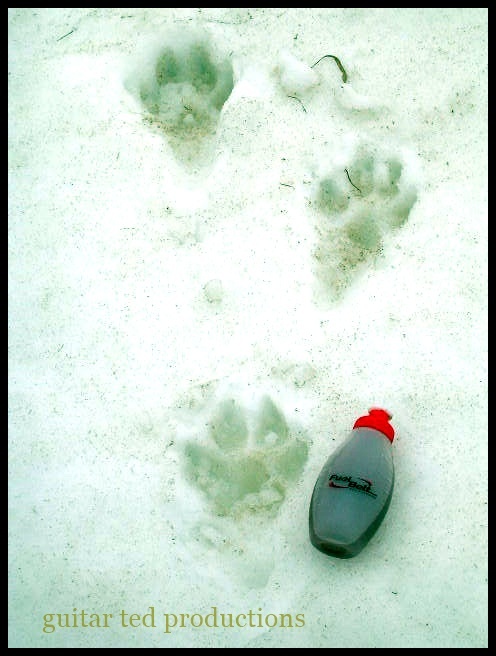 Big kitty tracks? I found these down near Hickory Hills in January of '06. Back in January of 2006 I was riding a single speed a lot as well. Mine was a Surly, but with bigger wheels! The Karate Monkey was my steed, and I was doing a lot of rides on gravel now, having been bitten by the bug when we had done the first Trans Iowa in 2005. That week in January ten years ago was not too bad temperature wise. We had gone through a bit of a thaw, and snow was rare except in ditches where drifts had been thick. I was on a ride down Ansborough Avenue to Tama County, where that turns into "U" Avenue, and to where that tees off into an East-West gravel. There I took a break to have a bit of Hammer gel and water. I was just casually looking around when I finally noticed these huge animal prints in the snow. A big kitty? I looked around, but saw no other evidence. I laid my gel flask next to one of the prints, took my picture that I wanted, and perhaps rode away a bit more hastily than I might have otherwise. This was near to Hickory Hills, a large, heavily wooded rural county park which had a lot of small game and deer within its boundaries. I suppose a bobcat wouldn't be out of the question, but in all my country travels, I have never seen evidence beyond this that they haunt our environs. These were also the rides I missed doing for the next seven years or so, since I had to place more effort into riding review stuff for Twenty Nine Inches. I think I really got the gravel bug bad, because I always wanted to get back to doing these rides after '06-'07 when that faded out of my repertoire. And here she is! The Karate Monkey from the ride I saw the cat tracks on. Then there is that bike- the Karate Monkey. My first 29"er. By this time, after three years of owning it, I had it dialed in about as well as I could get it for the technology of the day. Most notably, I had fitted On One Midge bars and an old Wright's English made saddle I got from an early 70's Raleigh. The bike had Cooks Brothers cranks in the 177.5mm length, and I ran a 37 X 18T gear on it, as I recall. Lots of folks were curious, at the time, as to what brake levers I was running with mountain BB-7's, which were what I had for disc brakes. I used old Shimano aero levers with the SLR cable pull. These were likely late 80's/early 90's levers. They pulled just enough cable more than standard aero levers that I could get the disc brakes to work pretty well, actually. It was a tricky, tricky set up to get it that way though. It looks like I have Bontrager XR tires on the bike here. This would have been one of the first tires Bontrager made for 29"ers, and they were really quite good. I remember how supple they were, and on hard pack they were fast, grippy, and never let me down. I'm pretty sure this is possibly the only set of 29"er tires I have worn completely out. All those miles on gravel too, for the most part. By the time I had accomplished that, Bontrager had dropped the original XR folders for a TLR version made in a different factory. They were never quite the same tire. Real? Imagined? Spoofed? Who knows? The original posting on the net apparently goes back to an Italian based cycling blog which shows a different imaging layout and is marked with the word "CONFIDENTIAL". The grainy image quality suggests this was grabbed from a screen shot. Images were also seen Thursday on the "Imgur" site here. Images are also watermarked "CONFIDENTIAL" and an embargo on release is seen with a late March date. There was a thread on this on mtbr.com which shows up on a Google search, but was taken down. The thread was dated December 2015. The Italian blog stated that the group was to be revealed in March, probably just ahead of Sea Otter, which would make sense, since SRAM historically has usually introduced big mtb group/product offerings during that festival. Comments: So, is this real? The images I've seen look convincing. 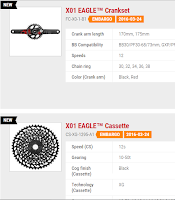 Would SRAM really want to do a 12 speed 1X group? One of the big complaints about XX1 is that the gearing range isn't as deep on the low end as a triple or 2X. Having one more gear, a 50 tooth cog, would put that complaint to rest, although the jumps between lower gears would still remain large. In the end, who knows? It all could be an elaborate hoax, although I will admit, a rather convincing one. Or, maybe someone actually slipped up, and this got leaked out early. My opinion is that it could be that this is SRAM's answer to critiques on its XX1 11spd stuff. I think it also could be fake. What I would rather see is SRAM adapting its wireless electronic technology for mtb. This development- if indeed it is real- doesn't do much for me. Remember Rawland Cycles? They made a splash starting in 2007 when they introduced a model with 650B wheels dubbed the Olaf. The company dabbled in 700c wheels with a model called the Draakar, then teased a few gravel grinder models and rando based rigs later on but the company kind of faded away. However; it would appear that now Rawland is set to make a new model or two and is launching a new look with them. Still steeped in Norse nomenclature, the bikes will feature several of the well known Rawland traits: low trail front end, steel frames, and versatility, but will feature all disc brake compatibility and on the Ravn, will be suitable with 26" wheels, with 650B and even smaller 700c wheels as optional choices. The other model, dubbed the Ulv, will be a B+ wheeled bikepacking type rig. Not much else is known yet, but details should be coming soon. I will be interested in seeing what is coming down the line with this brand since I used to know a couple of the fellows involved with it at the genesis of the brand almost 10 years ago now. You know what happens when you start putting on a race for over a decade? People think, "Hey! This guy must know what he is doing! ", or something along those lines. The reality is that I've just managed to stick it out all these years! But whatever- somebody thought I had something valuable to offer others, so I was invited to be a part of this tomorrow in Des Moines, Iowa. Specifically, I am going to be on the panel which starts at 10:10am concerning "Promotions, marketing, media". 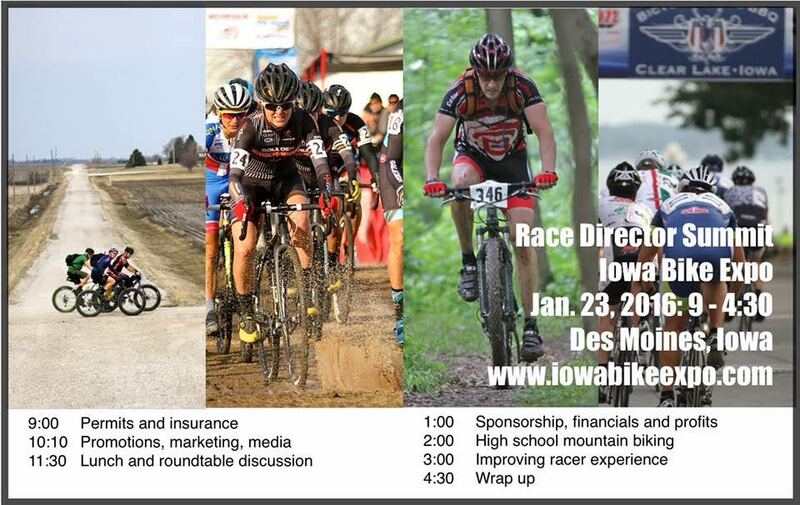 So, if you are around the Des Moines area, and are thinking about being a race director/promoter, you can check this out for free, (I believe it is free), and see what it is I have to say, along with several others far smarter and better looking than I. Of course, this means a two hour drive for me and so I will be getting up early tomorrow, heading South, gabbing, and then hitting up the Krunkwich Ramen House for noontime vittles. Afterward I may celebrate a little something-something, so stay tuned for whatever that may be and find a full report on the goings on, as far as I saw things, on Monday. So, for now I'll be signing off. Have a glorious weekend and enjoy whatever is left of your day and/or night! Wednesday I had to drop off the family truckster for routine maintenance, so since that vehicle has a Thule T-2 rack and a fat bike kit, I decided to take a fat bike so I could just leave the vehicle and take the opportunity for a ride. While my first choice, the Ti Muk, was out of commission with a mysterious soft rear tire issue, I decided that the Blackborow DS would have to do. Things have moderated around here weather-wise. It's in the teens above zero now! Funny how much of a difference that makes after being down below zero so often for a few days time. I was feeling fine and the streets and sidewalks were covered with a light dusting of snow we had gotten overnight. I had to be very careful about those hidden "land mines" of ice! But before that, I had to drive over to the repair shop. On the way, I scoped out possible routes through the downtown area. I knew my route coming back from the repair shop for about the first third of the way back. It was through an older residential area, and then I was going to cross the Cedar River near to where the former Rath Packing Company once was. All that's left of that now are a few mammoth brick buildings which are in various states of decay. I would avoid passing under the shadow of those derelict monuments of Waterloo's meat packing past and cross on the 11th street bridge which has been recently replaced. It's a nice bridge with a wide, smooth bike/walk way on the Eastern side. The morning Sun is shrouded by clouds over the Cedar River. I ended up spying out the bike path along the Cedar River, and since things had gotten above freezing for a while last week, and then froze hard, the once nearly unrideable powdery, sand-like snow was now a crusty fat biker's dream surface. So, although parts of the trail were deep in snow, I floated right on top with the massive 4.8"ers. It was fun while it lasted. I was bombing over some old drifts and climbing like a champ, despite icy patches where my wheel would spin out briefly. The almost Velcro-like traction of this drifted, crusty snow was a dream to ride on. Too bad there wasn't more of it on my route! One thing that I have become a little jaded by, and maybe forgetful of, is that many people still haven't seen a fat bike, or haven't seen one up close. I was reminded of that on my ride. As I was riding a wide bike path along a busy street, a guy in a work truck literally jammed on his brakes to stop and get a look at me as I rode down the walk. Good thing there wasn't any following traffic! I kind of felt like a circus freak for a moment or two, but then it passed. I kind of watched other people's eyes as they passed me by along the streets, and I also saw some of these drivers or passengers doing some rubber necking. It became kind of comical after a while. So, I guess fat biking is still kind of a rad deal, especially in Winter. I figured everyone knew about it by now. More than just a header! Every event I do has help from volunteers, and in the case of Trans Iowa, sometimes from folks that love the event. They want to play a part, but are not looking for any kind of return in the public eye. Just knowing that they helped gives them satisfaction. This next story is concerning an individual that fits this description. While I cannot reveal the identity of this person, I can tell you what this person is doing for Trans Iowa. It's a pretty cool gesture, in my opinion, and I think folks will really appreciate this. Especially if you are like me, and get a kick out of stickers. See that header image from the Trans Iowa site? That will be getting translated into a 4" X 8" sticker, just right for displaying on your vehicle, work bench, or kegerator. It should be exactly as you see here, or pretty darn close. There was a discussion about putting on the mileage, but I figured that Trans Iowa isn't always about finishing the event, and maybe if you didn't finish it, and the mileage was on the sticker, you would not feel comfortable sticking the sticker up. If ya know what I mean. So, the mileage was left off. Not only that, but this will also be translated into a banner, much like we had at Trans Iowa v11's checkpoint #1. So, hopefully this time the banner will make the rounds on the course instead of just getting to the first checkpoint! I'm sure many T.I.v12 hopefuls have similar ambitions! I also wanted to give a shout out to my friends and invaluable helpers, Wally and George, who have been with me since Trans Iowa v7. Wally started out by wanting to be a chase vehicle guy on a moto, but eventually wound up doing Checkpoint #2 with George for Trans Iowa v7 and v8. If you were lucky enough to have been at either one of those remote checkpoints, you know that they were legendary stops. Wally and George then became my defacto Spring recon cue card checkers and course checkers. Wally, with capable assistance from George, have also been the "Official Photography" for Trans Iowa the last several years as well. Many of you have seen the excellent work Wally puts out, but what you may not know is that during the years Wally has been a friend and asset to Trans Iowa, he transitioned into becoming a full time studio owner/operator. His business, The Studio at 46 West, has become a place known for quality imagery and I am proud to say that I have had Wally out to Trans Iowa to do what he does. One of Wally's images from the weather shortened T.I.v11 last year. I'm certain that if you have an event, or need something special in the realm of imagery, Wally can find a way to pull it off and make your jaw drop. He's a very talented guy, and I am blessed to have him as a Trans Iowa supporter, and more importantly, a friend. Check his stuff out, it is really good. I'm also really excited to be partnered up with WTB who have taken a shine to Trans Iowa and have done some extraordinary things along with Trans Iowa. They have introduced tires with Trans Iowa, and last year, Trans Iowa got the very first samples of the highly acclaimed Nano 40 TCS tires, which were the first tires introduced with a systemic approach that included rims and a tubeless accessory ensemble which made going tubeless a really easy thing to do. Look for another Trans Iowa sponsorship post coming soon. I got one of these bikes to ride where I cannot ride easily, or in many cases, at all, on another type of bicycle. Sometimes I ride a fat bike for certain sections of trail or commuting routes because, for those specific sections, I can ride rather than walk or barely ride at all. What this means is that I go do things many people wouldn't do with a fat bike, or attempt on any bicycle. I get my fat bikes dirty, sloppy, and I do things that are darned hard to do from a physical standpoint at times. Take for instance my first image here. That bit of bike trail covered in snow was barely rideable, and was completely taxing, physically, for me to do. So why do it? To learn and thinker out what I might want to do in the future with a fat bike. Like I said, not very many folks are willing to go to these extremes. My Ti Muk's constraints in the wheel department make it barely tolerable for my tastes. I started out on 3.8"ers, like many fat bikers did, but very quickly found the limits of flotation and traction. Look- I am a big guy at 6'1" and 240lbs or so- more with gear, if I have it. So, just like you need a longer, wider ski for skiing if you are big, so too with fat bikes in terms of rim and tire sizing. Well......that is if you really need a fat bike. Groomed trails don't really exist most of the time where I ride, and until this year, never did. Mud, sand, and loose rock? Yeah......not groomed. If you are going "out of bounds" on a fat bike, and if you are a bigger guy, wider tires and rims, like my Blackborow DS has, are often times necessary. Lighter folk need not apply. 4.0's will do you justice, but you won't catch me on those anymore. In my opinion, in many cases, a fat tire- a "plus sized tire"- is all you really need for much of the mountain biking and sometimes, even snow riding, that one can do around here. I remember riding a 2.4" 29"er tire on 35mm outside width rims on a packed snowmobile trail once during the Winter of 2010, and it was barely punching through. Now with 3" wide, "plus" sized tires? Maybe I could have pulled that off, but, granted, that was a very specific situation for me. The "plus" sized tires are lighter than fat bike tires are, and in many cases, a better choice than a fat bike. That is, if you don't plan on pushing the boundaries with your bicycle riding. If you are a smaller, lighter person? Maybe that is all you need. While you can fat bike single track, and it is fun, it is massive overkill. I still do that on occasion, but most of the time I realize I would go faster, with less effort, and arguably have more fun, on a lighter, snappier 29"er or "plus" sized wheeled bike. But hey- if it is your bag, have at it. Fat bikes are bicycles and are fun. I'm just saying that there are better, more efficient ways to mountain bike if you stick to established trails and will never venture beyond that sort of riding. When fat bikes came out, they were being used for serious, back country expeditions which required a different set of requirements than most riders would need now. Also, one must remember that even the early builders had no idea where fat bike technology would go. Geometry was still a work in progress back then. It still is a work in progress, in my opinion. The main difference is that now we're a lot closer to ideals than we were even a few years ago. This is getting close to where geometry is going to end up at, in my opinion. Fat bikes, in 2011 when I got my first Mukluk, were a far cry from the geometry we have today. Many have argued that moving around the main points of fat bike geometry by a mere few millimeters is not significant. However; it has made profound differences in how fat bikes capabilities have advanced in the last few years. Take, for instance, my Salsa Mukluk versus the Blackborow DS. The Mukluk is harder to shift weight on front to back, it is harder to loft the front end on the Muk, and the Blackborow corners more easily. 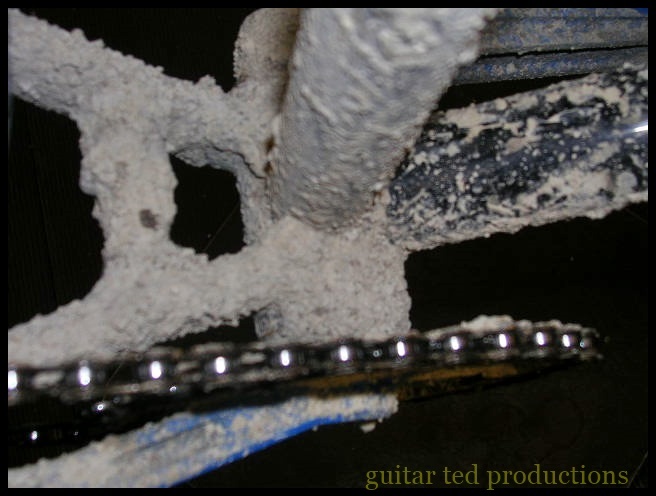 Fat biking in loose, deep conditions demands that you have a geometry that responds quickly to slight weight shifts, and that can mean the difference between cleaning a section, or dabbing and walking. I don't know about you, but riding- even if it is at a snail's pace- is more fun than walking is. It is my belief that the geometry is getting dialed in pretty close now, but there is another thing happening that might just push the geometry boundaries out even further than they are now. That thing pushing out the boundaries? Bigger tires. I am a big guy, as I said, and I like going places most bikes cannot with these ginormous tires. However; and this is perhaps just me, the Surly Bud and Lou tires are just falling a bit short at times. Now there are some bigger than Bud and Lou tires out which measure well over five inches wide and have far more volume than the previous "biggest fat bike tires". These bigger tires are pushing out the standards again, and making frame makers take another look at geometry and style of layout. I'm watching closely, because I can see where I would put these fatter shoes to use, and I would be walking less, going further, and riding in more unorthodox places. That said, I'm not getting rid of my Blackborow DS just yet, and I am not squirreling away dollars for a new, fatter fatty just yet. What I am seeing though, in regard to these huge tires, is intriguing, and I will be very curious to read and see more of these Vee 2XL tires in the future. Will there be a competing big tire choice? Will these bigger fatter meats catch on and show their worth in powder and muck? I am thinking much more positively about those things than I was early on. Especially for how I like to use a fat bike. And those are a few things I've learned about fat bikes, and my opinions about them......so far. One of these events that has always intrigued me is "Gravel Ride For Masie's Pride", which, besides the strange name, is an event that also happens to use the Flint Hills as their playground. I'll spare you all the details here because my partner, Ben, and I just wrapped up and published a great podcast about the event with it's founder and director, "Uncle Dudley". Check that out by clicking HERE. This post will be more about the getting of this show back up and going again after about seven months of being dormant. It wasn't our intentions to have let things go this far. However; there are a couple of reasons, in my opinion, for why this all happened the way it has. 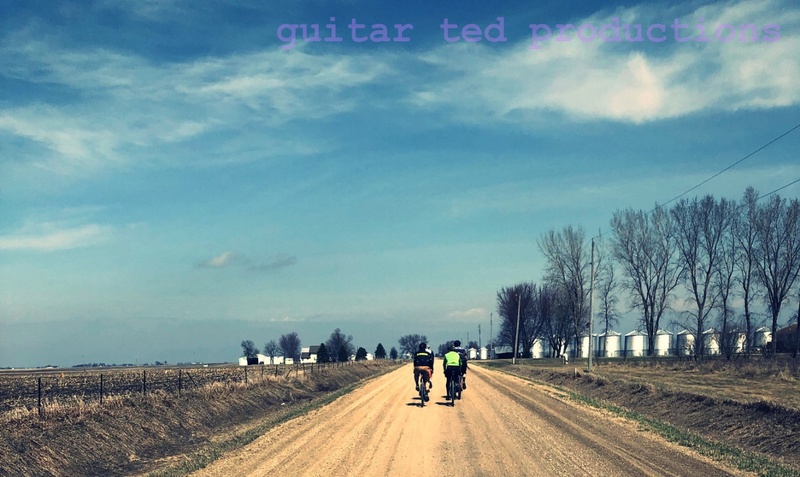 The first thing is that Ben is the founder and head honcho of Mountain Bike Radio, which is the entity that hosts and produces the Riding Gravel Radio Ranch. Now MBR.com has tons of great podcasts. While Ben doesn't have to shepherd them all, he has a busy time riding herd on the ones that he does have a direct hand in. That takes a lot of time. Secondly, Ben and his family moved during the time we were off, and that interrupted things a bit. Then it got to be Summer, we both got busy with other stuff, and next thing ya know, it is Fall. I was doing everything I could during the Fall to squeeze in some review work before Winter came. Doing a Radio Ranch show wasn't on my radar then. So, I wasn't really even thinking this would happen again. I mean, maybe someday, it would, but I was not thinking very positively about it. That was until Uncle Dudley got a hold of me and asked if doing a podcast might be possible. So, I'm blaming him for all of this getting cranked up again. The result was that it did get cranked up again. I was glad to find out we were getting the generators dusted off, plugging the mics in, and doing sound checks. I happen to enjoy doing these, and I sure hope folks like listening to the podcasts. Hopefully we won't be letting things slip into forgetfulness again, and another Radio Ranch podcast will happen again sooner than later. 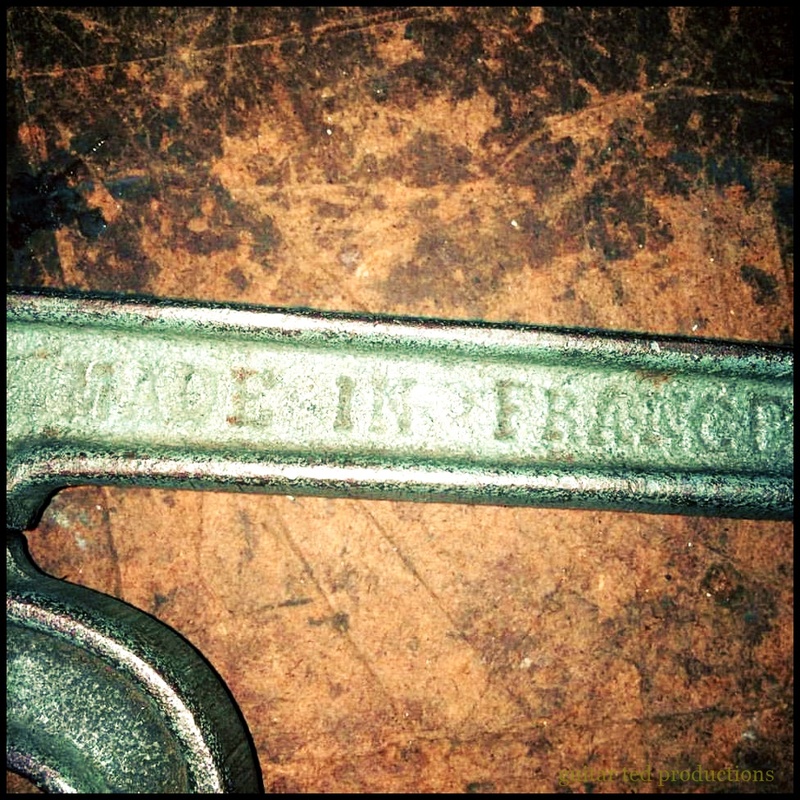 Shimano "333" shifter for a 3 speed internal gear hub from an old Huffy 20"er. Front Derailleurs: Should We Really Lose Them?